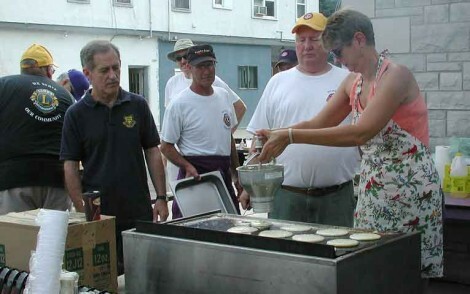 Ridgeway Lions served up pancakes to kick off the 23rd annual Ridgeway Summer Festival Saturday. Ridge Road is alive with art, music, food, fun and all kinds of entertainment for adults and kids alike. Musicians are playing all day at two venues, artists and merchants are displaying their wares, and anybody who’s anybody is out on the street. The weather is hot and muggy, there’s a halo around the sun and plenty of refreshment and food. Water is only 50 cents at the Chakra Spa table, typical of the many values available. There’s many benches, lots of shade and tons to see and do all day today and tomorrow. Driving there is tricky. As well as Ridge Road being closed north and south of Dominion Road from Wilson to Highland, Prospect is closed for construction from Cutler to Hibbard. Farr Avenue is also closed for construction from Park Street to Ridge. Parking on the side streets is cramped, the main parking lot is closed. There’s some parking behind the Trailside, Beer Store, Legion, CIBC and RBC, St. Luke’s Church, the High School and Dominion Road is fairly wide but there are local parking restrictions. There’s some room at the old Ridgeway Furniture on Gorham as well as the old Rona location. Plan on walking. Also, the area is served hourly by Fort Erie Transit and the Friendship Trail is a nice bike ride today. Do us all a favour, please, and keep your dogs at home. Unattended children will be fed chocolate bars and coffee. The Ridgeway Crystal Beach Kinsmen street dance features popular rock and roll combo Guilty Pleasures with great big speakers and beer until 1 a.m. so they probably start around 9 p.m. Beer garden opens at 7 p.m.